WPC’s ADA (Active Disciplined Approach) is a time-tested investment template for creating, monitoring, and adjusting model portfolios utilizing a disciplined approach to take the emotion out of investing. 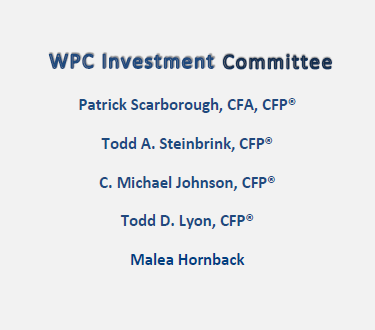 The WPC Investment Committee is responsible for the model portfolios and regularly meet to discuss the impact of the current economic environment, valuations, & various risk factors on portfolio performance. The committee has the advantage of providing different viewpoints from each member’s unique experience, philosophy, and knowledge of the clients they serve. Decisions are made in a deliberate fashion and systematically applied across all client portfolios. The principle of asset allocation is central to WPC’s investment process. We have tested this principal since our inception in 1984, in times of great economic expansion, in times of great economic contractions, and in non-eventful periods. Our conclusions are firm: Asset allocation is the foundation for principled investing & rebalancing to targeted allocations is the best method to reverse the “Cycle of Market Emotions”- the emotions of fear and greed – by utilizing benchmarks to take advantage of when the market is signaling overbought and oversold.